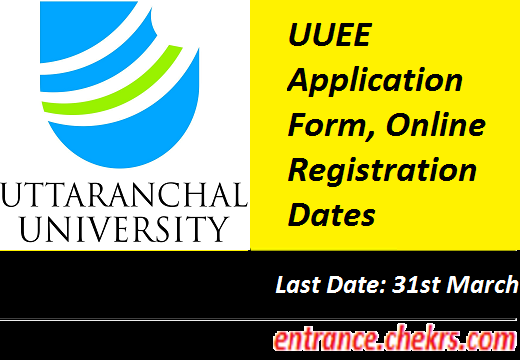 UUEE Application Form 2019 : Uttaranchal University has opened its admissions for various UG and PG courses. For the admissions in UG and PG courses, Uttaranchal University conducts an exam every year. Aspirants who are seeking for the admissions in Uttranchal University can apply for the Uttranchal University Entrance Exam 2019 Application Form till Last week of March 2019. Latest Update: Admissions Open for Winter Session (2018-19) of One Year Certificate Course in Hotel Management. Uttranchal University can fill the application form 2019 with the help of official website of the university. The Uttranchal University Entrance Exam 2019 Registration Form will be submitted only by online process. The last date for the submission of registration form is Last week of March 2019. For the submission and filling of the application form, aspirants have to register on the website. There are some steps to follow related to filling and submission of the application form. Visit the official website of Uttaranchal University, i.e. uttaranchaluniversity.ac.in/. Aspirants have to fill their details in “New Students? Signup” panel. Now, select the “Sign Up” Button. A mail will be sent on aspirant’s email-id for the confirmation and registration activation link. After opening that link the online registration account will be activated. Now login on the website and continue the remaining registration. Now hit the submit button for the submission of the application form. The application fee will be paid via net banking, credit/debit card. Take a print out of the application form for future usage. Aspirant appearing/passed 12th in PCM with minimum 50% marks (45% for SC/ST). For integrated courses, aspirants appearing/passed 12th from a recognized board. For LLB (Hons.) Aspirants who have passed their graduation from any discipline can apply. Aspirants cleared 12th from any recognized board can apply. A processing fee of Rs 50/- will be charged from the aspirant in case of payment through Debit card/Credit card and Internet Banking and the total fee to be submitted is Rs. 1250/-. UUEE 2019 will be conducted for admissions in UG and PG programs. The UUEE 2019 exam conducting authority is Uttranchal University. The admissions in engineering programs will be based on the JEE main scorecard. The last date for the submission of the UUEE 2019 Registration Form is last week of March 2019. Aspirants who are interested in taking admissions in Uttranchal University can apply for the application form on the official website of Uttranchal University (i.e. uttaranchaluniversity.ac.in). For more queries related to Uttranchal University 2019 Application Form, you can contact us by commenting in the comment section given below.